MormonInfo.org - FAQs - Doesn’t John 14:2-4 teach that there are kingdoms of glory or heavens? LDS assume from this passage that Jesus is speaking of various levels of heaven: Celestial, Terrestrial, and Telestial. It is helpful at this point to understand that technically LDS hold that the Father’s home is in the Celestial Kingdom (D&C 76:92), Jesus rules there as well (D&C 76:62), but also over the Terrestrial Kingdom, and the Holy Ghost rules over the Telestial Kingdom. This means that those in Terrestrial or the middle kingdom “receive of the presence of the Son, but not of the fulness of the Father” (D&C 76:77), and those in the Telestial or lowest kingdom are ministered to by the Holy Ghost (D&C 76:86), but cannot dwell with God or Christ (D&C 76:112). The worthiness of an individual in this life determines where he or she will dwell after the judgment. But for the believer, he or she is complete in Christ (Colossians 2:10). As the context of John 14 demonstrates, to be in Him is to also be in the Father since they are both the only true God, and no one can take the believer out of His hand (Jn. 10:27-33, 14:23, and 1 Jn. 5:10-13). Jesus promises His disciples that He is going to take them to be with Him in His Father’s house. 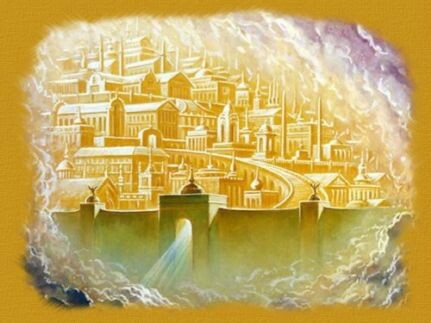 Within that dwelling place are certainly many mansions, but there is no indication from this passage that His disciples will be somewhere other than the Father’s house. This is the peace the believer has with God through our Lord Jesus Christ (Romans 5:1). He is the believer’s worthiness. “For he hath made him to be sin for us, who knew no sin; that we might be made the righteousness of God in him” (2 Corinthians 5:21). For other LDS attempts to biblically justify three kingdoms of glory, see my responses to 1 Cor. 15:40-41 and 2 Cor. 12:2.